Dustin was lucky enough to have grown up in Waterbury, Vermont and spent some of that time working for Ben & Jerry’s, giving him a deep appreciation for companies that make a commitment to environmental and social change. 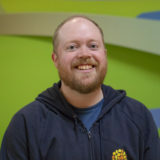 Dustin recieved his bachelor’s degree in Psychology from the University of Vermont and spent the following years working in mental health and the ski industry. His most recent career was as a route driver for FedEx where he developed skills he will bring to Suncommon’s warehouse team. He is excited to join a team that cares about what they do and the community they are a part of. Dustin lives in Waterbury (close enough to the office to ride his bike) and spends his time outside of work teaching skiing, playing disc golf and seeing concerts.